Kayak car top carrier a simple, low-cost solution to carrying your kayak.This Kayak Carrier designed mounts to virtually all crossbars and load bars on the market. The carrier secures the kayak on its side, consuming minimal space on the load bar. As shown in the pictures we put the Kayak Rack on the Ladder Rack Bar.A maximum of 4 sets of kayak racks can be mounted on a full size truck.Don't hesitate to buy it! 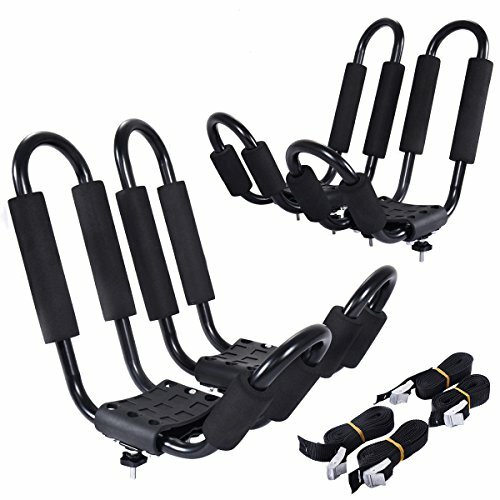 【Exquisite Craftsmanship】The Bars of this kayak carrier are made of 15mm thick steel tube, with four straps which can hold 36" Wide and up to 150 lbs Kayak. All surfaces are coated with high quality out -door paint, can resist all weather condition and use for a long life. 【Rubber Pedal & Foam Protector】The foam padding and the rubber base cover are made of real rubber and foam. They are water and sun resistant. 【Indented Tubing Design】Indented tubing design and strong, stable and pre-punched holes are for perfect alignment. 【Convenient to Use】Quick on/off hardware ensures fast installation and removal. 【Many Applications】J-Bar style easily supports different cargo such as Skis, Canoes, Paddle Boards and other outdoor gear.